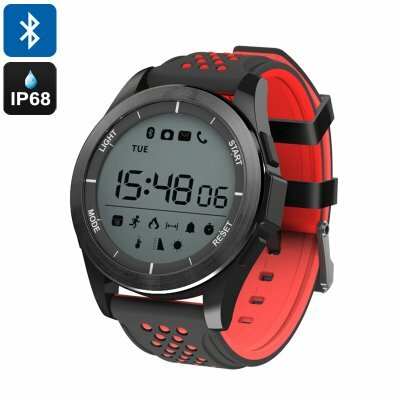 Successfully Added NO.1 F3 Sports Watch - Pedometer, Sleep Monitor, Sedentary Reminder, IP68 Waterproof, Bluetooth 4.0, 1.1-Inch Display (Red) to your Shopping Cart. The NO.1 F3 is an affordable Bluetooth fitness tracker bracelet that will guide you towards a healthier future. This sports watch features a pedometer, sleep monitor, sedentary reminder, and more. With all those smart health features at hand, you can be guaranteed that you’ll never miss out on a workout again. Through Bluetooth, your sports watch is compatible with both iOS and Android smartphones. When synchronized, it lets you receive call reminders, message reminders, and social media reminders straight from your wrist. Like this, you can be guaranteed that you’ll never miss out on an important message again. With its accurate pedometer, this Bluetooth fitness tracker informs you throughout the day about the number of steps you have taken. Thanks to this, you’ll be able to keep track of your exercise and make sure you’ll meet your daily activity levels. With its sedentary reminder in place, this sports watch will remind you to exercise on daily basis. Therefore you can be guaranteed that you’ll never miss out on a sporting session again. Thanks to its IP68 waterproof design, you’ll be able to use this Bluetooth watch in any type of weather condition. In between your workouts, this Bluetooth sports watch makes sure that you’ll get enough rest thanks to its sleep monitor. This smart health feature will support you throughout your recovery phase to make sure that your muscles rest and grow in a healthy manner. Not only does this bring you the fastest results, it also limits the risks of injuries. The NO.1 F3 fitness tracker bracelet runs on a CR2032 button battery that brings along up to 1 year of continuous usage time.